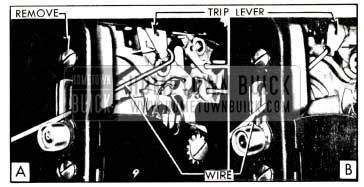 All 1951 Buick doors may be locked from the inside by pushing down the locking knob which projects through the garnish molding. All 1951 Buick doors may be locked from the outside by first pushing down the inside locking knob then holding the outside push button depressed while closing the door. Rear doors cannot be unlocked from outside the car. Both front doors can be unlocked from outside by inserting key in the safety lock incorporated in the outside handle push button. The outside safety locks are operated by the same key that operates the ignition switch, glove box door lock and rear compartment lid lock. 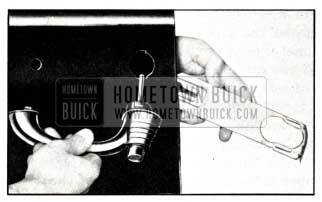 A “free-wheeling” linkage incorporated in the rear door locks permit adjustment so that the 1951 Buick doors cannot be opened by operating the inside handle when the locking rod knob is down. This safety feature, desirable where small children ride on the back seat, prevents accidental opening of a rear door when the car is in motion. Locks are set for “free-wheeling” at the factory and must be reset for positive operation at the request of car owner. 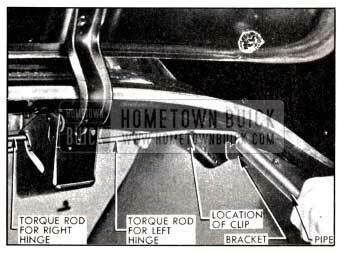 The 1951 Buick door lock is the lift bolt type. As the door is closed the lock bolt enters the upper guide channel of door lock striker and is forced upward until the locking mechanism is engaged at the top of bolt travel. When the locking mechanism is tripped to unlock the door, the bolt is forced downward and out of the striker. A dovetail wedge mounted on the lock engages the lower channel in the door lock striker. A spring loaded bumper is mounted in upper side of the dovetail wedge channel. Remove the lock attaching screw just above the bolt slot in lock pillar so that the free wheeling trip lever can be sighted through the screw hole. Light from a small flashlight can be admitted through the bolt slot to aid in locating the trip lever. To change lock from free wheeling to positive operation, insert hook end of wire through bolt slot and pull outward on free wheeling trip lever. See figure 13-3, view A. To change lock from positive operation to free wheeling, place hook against near side of trip lever and push lever inward. See figure 13-3, view B. 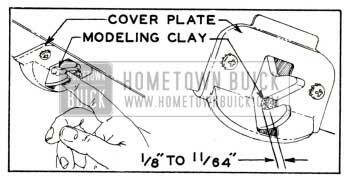 On Series 50-70, release the 1951 Buick door rubber weatherstrip from lock pillar face adjacent to handle. Some front doors have a weatherstrip support at this point which must also be removed. Remove screw holding the handle retainer to lock pillar face. On all series, pull out the fiat spring handle retainer until handle can be removed. See figure 13-4. Remove 1951 Buick door outside handle (subpar. c, above). Remove retaining snap ring, then remove stop washer, spring, and detent washer from handle; note the relative position of the stop and deterit washers to insure correct reinstallation. See figure 13-5. Install safety lock in handle by reversing the removal procedure. When installing push button shaft in lock cylinder, install the lock washer and retain it with a spring ring which is furnished for service to eliminate clinching the lock washer to cylinder. Remove 1951 Buick door outside handle (subpar. b, above), door trim pad (par. 13-16) and remove inspection hole cover from door inner panel below the lock. On Series 40, remove the glass run channel retaining screw through inspection hole. On Series 50-70 front door, or rear door without ventilator or stationary glass, remove the glass run channel retaining screw on lower outer face of 1951 Buick door lock pillar. 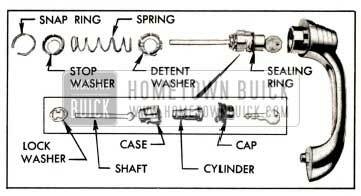 Install 1951 Buick door lock and other parts by reversing removal procedure. NOTE: On all except sedan rear doors a molded rubber water deflector is cemented across top of door lock. Make sure deflector is securely cemented before installation of lock. Before installing lock make sure that bolt is in “down” position. On 1951 Buick front doors the U-shaped retainer on lock housing must be threaded behind the lower end of glass run channel during installation. This can be done by slightly pulling out lower end of channel. Seal the inspection hole cover before installing it on door inner panel. 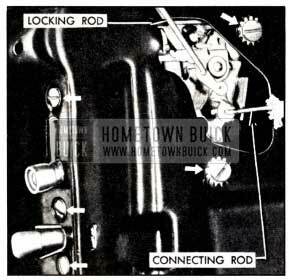 The 1951 Buick door lock striker may be adjusted in or out, up or down, by loosening the striker attaching screws. Serrations on the back of striker and on the body pillar, coupled with a floating anchor plate in body pillar, allow for these adjustments. Before removing the door lock striker or making an adjustment it is advisable to mark its position on body pillar with a pencil. This will permit it to be reinstalled in the same position, or will aid in gauging the amount of adjustment and aid in maintaining its vertical position. 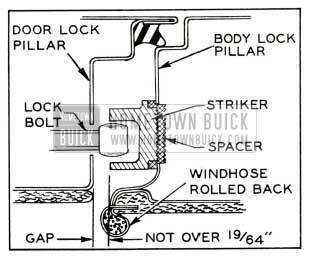 The 1951 Buick door lock striker should be adjusted in or out to secure good contact of door weatherstrip with body and to permit positive locking of door lock bolt. The striker should be vertically adjusted so that the dovetail wedge and the lock bolt enter centrally into the guide channels of striker. The dovetail wedge and striker should support the lock side of door without upward or downward strain. NOTE: Striker must be maintained in a vertical position on lock pillar to insure proper contact with dovetail wedge and lock bolt. When correct engagement between the door lock lift bolt and the striker cannot be obtained, close the door and carefully roll back the windhose to check the spacing between the striker and the door lock pillar, using a suitable gauge. If the spacing exceeds 19/64 “, install a door lock striker spacer (Group 10.571) as shown in figure 13-7. Be sure to use the longer striker screws listed in Group 10.571 to insure safe anchorage of the striker and spacer. A molded rubber weatherstrip, composed of several pieces, is cemented to the flange and hinge pillar of each door. A sheet metal retainer attached to the 1951 Buick door gives support to the weatherstrip along bottom edge of door. The retainer has a scalloped flange which is crimped over the base of weatherstrip after it is cemented in place. On rear doors, the weatherstrip is cemented to the face of door hinge pillar and is also supported by a sheet metal retainer attached to hinge pillar with screws. On each Series 50-70 front door, a bellows type sealing strip is cemented to the cowl and to front surface of door hinge pillar in such position that it is not affected by the swinging movement of door. On Series 40, the rear compartment lid is sealed by a molded rubber weatherstrip cemented to the gutter flange all around the opening in body. On Series 50-70, one weatherstrip is cemented along the bottom and sides of the compartment lid flange; another weatherstrip is cemented into the-gutter along the top and upper corners of the body opening. Between the two compartment lid hinges, four bolt type retainers are also used to secure the upper weatherstrip in the gutter so that it will not be curled out of position when the lid is opened. A rubber washer and a plain washer are placed between the body panel and the nut on lower end of each retainer bolt. Moving the door or lid inward for closer contact of rubber weatherstrip may be accomplished by lock striker or hinge adjustment. 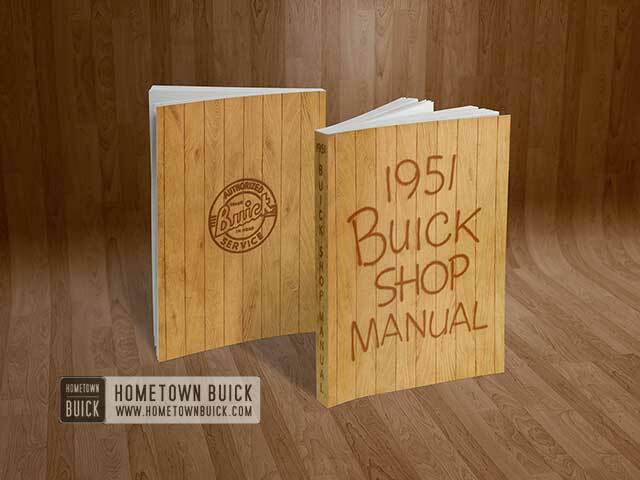 If 1951 Buick door or lid is in proper alignment in body opening, however, correction of air or water leak will probably require correction of rubber weatherstrip condition. If weatherstrip is loose or distorted it should be loosened sufficiently to permit proper adjustment and recementing. If damaged or deteriorated the weatherstrip should be replaced. If the weatherstrip was attached with the original factory adhesive which has a neutral color, clean the adhesive from metal surface with a putty knife or a dry rag. It is not necessary to remove this adhesive from the weatherstrip. Do not use solvents (oleum spirits, gasoline, etc.) to clean off this type of adhesive. If the weatherstrip has been previously reset with the black adhesives used in service, it may be necessary to use oleum spirits or a similar solvent to clean off the old adhesive. Keep coated parts separated and allow cement to air dry until “tacky,” which requires about 15 minutes. If parts are joined when cement is wet the weatherstrip will not adhere properly. IMPORTANT: Do not close the door or lid for at least a half hour after re-cementing or installation of weatherstrip. It time permits, leave open for a longer period. If door or lid is closed before cement is thoroughly dry, the pressure against lip of weatherstrip may cause the weatherstrip to pull away from its cemented base and early failure of the installation may result. If only the upper end of sealing strip is damaged in the area above the upper door hinge, repairs may be made with a patch strip which is available for service. This patch strip should be installed in the same manner as the upper end of a full strip, should overlap the lower portion at least one inch on the forward side and should be securely cemented to lower portion where it overlaps. Carefully loosen the broad end of door rubber weatherstrip that is cemented over the upper end of sealing strip. Remove the door stop and all metal fasteners that attach the sealing strip to door and cowl, then remove the sealing strip. Clean off all old adhesive from door and cowl where sealing strip was attached. Use 3-M Weatherstrip Adhesive to cement the new sealing strip to the front face of door hinge pillar. In this operation insert the fastener stud on lower end of hinge pillar through the hole in the sealing strip to insure proper vertical position of strip. See figure 13-8, view C.
Use 3-M Weatherstrip Adhesive to cement the sealing strip to the body hinge pillars aligning the edge of sealing strip with corner contour of cowl panel. See figure 13-8, view A. In this operation it is very important to allow just enough fullness at upper end of sealing strip to prevent any strain on it when the door is fully opened. See figure 13-8, view B. Use 3-M Weatherstrip Adhesive to cement the broad end of door rubber weatherstrip in place over the sealing strip. Place a new disc clip over fastener stud on door, install metal retainers which secure lower end of sealing strip to door and cowl, install door stop, and install metal retainer which secures upper end of sealing strip to cowl. The following general instructions apply to all doors. 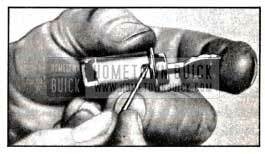 For specific instructions on adjustment of door hinges see subparagraph c.
1951 Buick Doors are heavy and hard to handle if all hinges are loosened during door adjustment and it may require the services of two men, one to hold the door at the correct adjustment while the other man tightens the hinge. In some cases it may be necessary to use a combination of vertical, in-and-out and fore-and-aft adjustments to secure proper fitting of door in body opening and proper contact of door weatherstrip with body. After door hinges have been adjusted for proper fit of door in body opening install and adjust the door lock striker as described in paragraph 13-5 (f). On Series 40 front doors, up, down, in, and out adjustment at hinges is provided through floating hinge bolt anchor nuts mounted in front body hinge pillar. Hinge bolts are accessible with door opened. Forward and rearward adjustment, together with a slight up and down adjustment, is provided by the slotted bolt holes in hinge gooseneck strap where strap is bolted to door. It is necessary to release the door trim pad to reach these bolts. On Series 50-70 front doors, slotted hinge bolt holes and floating anchor nuts in the front body hinge pillar provide up and down adjustment. In and out adjustment is provided by slotted holes and floating anchor nuts in door hinge pillar. All hinge bolts, except on door end of lower hinge, are accessible with door opened and hinge cover plates removed. The attaching bolts for door end of the Series 50-70 front door lower hinge are covered by the sealing strip cemented to door pillar. To reach these screws, raise hood and work through the space between fender and cowl in front of door. Pry off the circular disc clip retaining the lower end of sealing strip to snap fastener stud on door pillar, then carefully loosen lower end of sealing strip to uncover hinge screws. After hinge adjustment recement sealing strip; first attach strip to fastener stud with a new disc clip and then press cemented area of strip to door pillar. Install metal retainer which secures sealing strip to door. Forward and rearward adjustment of Series 50-70 front doors is not provided since this adjustment should not be required unless the hinges or door have been distorted by an accident. A bent hinge should be removed and straightened or replaced. On all series rear doors, slotted hinge bolt holes and floating anchor nuts in the door hinge pillar provided up and down adjustment. 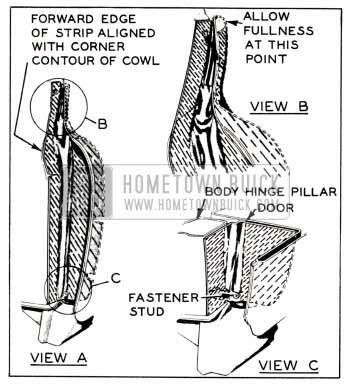 In and out adjustment is provided by slotted holes and floating anchor nuts in the body hinge pillar. All hinge bolts are accessible with door opened and hinge cover plates removed. On Series 50-70 doors it is necessary to loosen the weatherstrip and its retainer from the hinge area. See figure 13-9. A slight rearward movement of a rear door may be obtained by placing a thin full-width waterproof cardboard shim between the hinge strap and body hinge pillar. Greater movement may be obtained, if necessary, by placing a narrow shim between the outer edge of hinge strap and body pillar to tilt the hinge and move door rearward. To move a rear door forward, place a narrow waterproof cardboard shim between the inner edge of hinge strap and body pillar to tilt the hinge and move door forward. When 1951 Buick door hinge adjustments are completed be sure to reinstall all hinge cover plates. Before installation on rear doors, fill the hinge depression at top and bottom of hinge strap with 3-M Autobody Sealer in the areas covered by the plates, also brush sealer on inner surfaces of cover plates. It is important to have joints around hinges water tight. Re-cement weatherstrips and sealing strips where these have been loosened, and attach rear door weatherstrip retainers with screws. On Series 40 front doors, flat steel springs are mounted in the upper and lower hinges to provide check and hold-open devices. Each spring contains a channel which engages the gooseneck strap of hinge when door is fully opened, thereby limiting door opening and holding door in opened position. First production jobs are provided with a check link similar to the rear door check link (subpar. e) and hold-open springs are not mounted in the hinges. On Series 50-70 front doors, a check link is used which contains a pair of springs for counterbalancing the door to hold it open, while the toggle action of the links establishes a definite hold-open position. The check link is not adjustable except for its position on door inner panel. The bolt holes in door inner panel are slotted to permit proper location of check link so that it will operate without binding. A separate non-adjustable stop mounted on the front face of door hinge pillar provides a definite wide-open stop for the door. The rear door check link device consists of a flat spring steel link anchored to the center body pillar and a roller support mounted in the door hinge pillar. The hooked rear end of the link engages the roller on the support to limit the door opening. On Series 40, the hooked end of link is formed to provide a hold-open stop, while on Series 50-70 a tapered lug on the link provides the hold-open stop. See figure 13-9. The check link support attaching screw holes are slotted so that support can be moved laterally to increase or decrease the hold open force. If proper hold open force cannot be secured by this adjustment, a shim may be placed between the link and center body pillar at point of attachment. If door does not stay in hold-open position place shim to rear of bolt and in line with end of the spring washer on link strap. If door snaps shut, place shim forward of bolt and in line with end of check link strap. On Series 50-70, an adjustable door stop is mounted on the door hinge pillar about midway between the hinges. This stop is a wedge shaped plate that can be moved in or out to adjust for fully opened position of door. See figure 13-9. After the hinge side of compartment lid is properly aligned, the lower or lock side of lid may be adjusted for alignment with body rear end panel and proper contact with weatherstrip by adjusting the lock striker up or down as required. Some models have adjustable rubber bumpers on each side to steady the lid near the lower corners. These should be adjusted to contact underside of lid when closed, but not so that lid cannot contact the weatherstrip. The striker must not be set so low that the lock cannot snap into a securely locked position when lid is pressed down. To check the amount of engagement of the lid lock bolt with the striker, press a small wad of modeling clay into inner end of lock bolt slot, then close lid with a moderate slam. Open lid and check thickness of clay remaining in the slot; this should be 1/8″ to 11/64”. See figure 13-10. If proper lock bolt engagement cannot be obtained by adjustment of striker, insert a spacer under striker to get the desired engagement. On Series 40, the lock cylinder is retained by a fiat steel retainer on inner side of the lid outer panel. To remove lock cylinder, reach through access hole in lid inner panel and pull forward on upturned end of the retainer to disengage it from the cylinder. When lock cylinder is installed by reversing removal procedure be sure to cement the gasket which is placed between lid panel and the outer flange of lock cylinder. On Series 50-70, it is necessary to remove the emblem base assembly in order to remove the lock cylinder. Remove the four screws attaching the emblem base assembly to lid panel, working through access holes in lid inner panel. Carefully remove emblem base assembly, which is cemented to the rubber gasket which is also cemented to lid outer panel. Remove lock cylinder which is attached to emblem base by two screws. Before installation of emblem base assembly, recement the base gasket to lid outer panel if it is loose. Apply cement to joining surfaces of gasket and base before installing emblem base assembly. To remove the rear compartment lid lock assembly, remove lock screw, the four lock and cover plate screws, and the cover plate shown in figure 13-10. Lock assembly can then be removed from lid inner panel. The 1951 Buick door is held in closed position by a lock with a sliding latch which engages a striker on instrument panel. When the lock cylinder is pushed inward the latch is retracted to unlatch the door. When lock cylinder is turned to locked position by means of the ignition key, the cylinder cannot be pushed inward to unlatch the door. 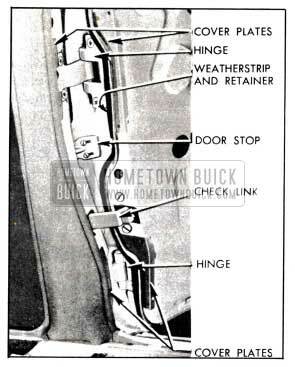 The 1951 Buick door lock striker is adjustable to provide proper contact of upper corners of door with rubber bumpers mounted on instrument panel. The striker should be adjusted to prevent rattle but not tight enough to interfere with operation of the lock.